Live within a 5 minute walk from one of the beautiful beach of the area.This 3800 sq ft ocean view house has 4 levels on 1 acre of land. The master bedroom features a walk in closet, full bathroom, AC and fan. The living area which encompases a kitchen, dining room and living room is gigantic and has an open area concept. There is a huge lookout room/loft on the top level that can be used as an extra bedroom or just to sit and watch the spectacular sunset. The house includes an attached garage/workshop great for a handyman and has a full locked secure room. The is an additional carport one level below the house. And a few kilometers north is the emerging new commercial center of Uvita. Uvita combines services such as banks, pharmacies, supermarkets, business centers, hair salons, service stations and a medical center, while retaining a sleepy “beach and jungle” atmosphere. 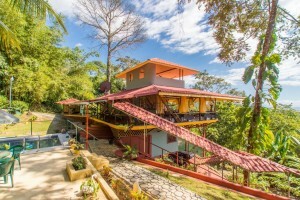 Ballena offers a unique combination of breathtaking views, and impressive elevation, yet access off the Costanera Sur Highway is quick and easy. Keep an eye out for ballenas (whales) off your future balcony!